Cross country can be dated back to the early 1800's in England where it was a team sport in public schools. At that time, the sport was named "Hare and Hounds" or "The Paper Chase." The sport would consist of a group of runners that would lay a trail of paper or other devices to mark a trail and another group of runners would follow the trail. In 1837, the first competition was held at Rugby School, which later turned into the sport having a course pre-set over open country land. Participants sometimes had to run through streams, jump fences, and go through hedges. 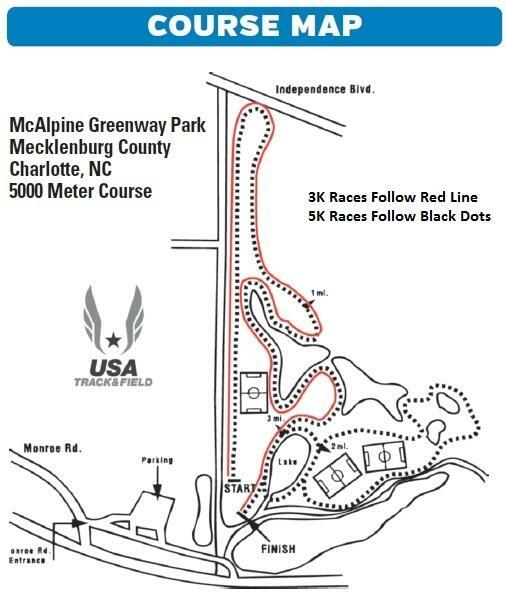 Come out to McAlpine Creek Park and run a classic course on a Saturday morning. **Home of the Foot Locker SOUTH Championships since 1982 and various other championship meets. -- 5:15 pm Boys' Middle School Inv. (3k)...Top 20 individuals receive a dog tag with race name and place on it. -- 5:40 pm Girls' Middle School Inv. (3k)...Top 20 individuals receive a dog tag with race name and place on it. -- 8:05 am Boys' Championship (Most competitive race, 7 runners max per team)...Top 20 individuals receive a dog tag with race name and place on it. -- 8:30 am Girls' Championship (Most competitive race, 7 runners max per team)...Top 20 individuals receive a dog tag with race name and place on it. -- 9:00 am Boys' Invitational (Next most competitive race, 7 runners max per team)...Top 20 individuals receive a dog tag with race name and place on it. -- 9:30 am Girls' Invitational (Next most competitive race, 7 runners max per team)...Top 20 individuals receive a dog tag with race name and place on it. -- 10:00 am Boys' open (for rest of runners or less competitive teams)...Top 20 individuals receive a dog tag with race name and place on it. -- 10:30 am Girls' open (for rest of runners or less competitive teams)...Top 20 individuals receive a dog tag with race name and place on it. -- 11:15 am Boys' middle school championship (3k)...Top 20 individuals receive a dog tag with race name and place on it. -- 11:35 am Girls' middle school championship (3k)...Top 20 individuals receive a dog tag with race name and place on it. Medical: Novant Health and school trainers will be available for emergency care, basic first aid, and taping. Water, injury ice, and an AED will be accessible at the Sports Medicine tent located near the finish line. If your athlete will require taping, please supply your own taping and/or padding materials. All teams are encouraged to bring water for their team areas. -- Top two teams in each race receive a unique trophy made made by a local potter exclusively for this meet. -- Top individual in each race receives a "Hare" trophy. -- Second-place individual in each race receives a "Hound" trophy. -- Top 20 individuals in each race receive a dog tag with race name and place on it. Concessions: There will be some packaged food, snacks and drinks for sale. T-Shirts: There will be t-shirts at $10 each (approx. 300 so please come early. Orders may be taken for more if they run out.) NEW design for 2018!!! --- Our sponsor, Charlotte Running Company, will be there with shoes and other items. Results: will be posted to athletic.net and ncrunners.com. There will be one set posted to the announcement boards at McAlpine (if the board is up). After the meet a link to the results will be emailed to all coaches. TEAMS from Alaska, Colorado, Georgia, South Carolina, Virginia, and, of course, North Carolina have competed at this meet. If you would like your school to compete, and your team is from a state other than the ones listed above, please email Brett Honeycutt (brettrhoneycutt@hotmail.com). *** VARSITY RACES: All varsity athletes can run in any varsity race regardless of what they signed up for. Middle School: MS runners can run either day/race. QUESTIONS: Email meet director Brett Honeycutt at brettrhoneycutt@hotmail.com if you have any questions. (COACHES you can change what race your runners compete in on race day without notifying us - as long as they are entered in a race, they are good to go.). -- Individual entries are $15 each.